“Waste not, want not.” This old saying rings so true today, as global leaders and local communities alike increasingly call for a fix for the so-called “throwaway culture.” But beyond individuals and households, waste also represents a broader challenge that affects human health and livelihoods, the environment, and prosperity. Solid waste management is a universal issue that matters to every single person in the world. 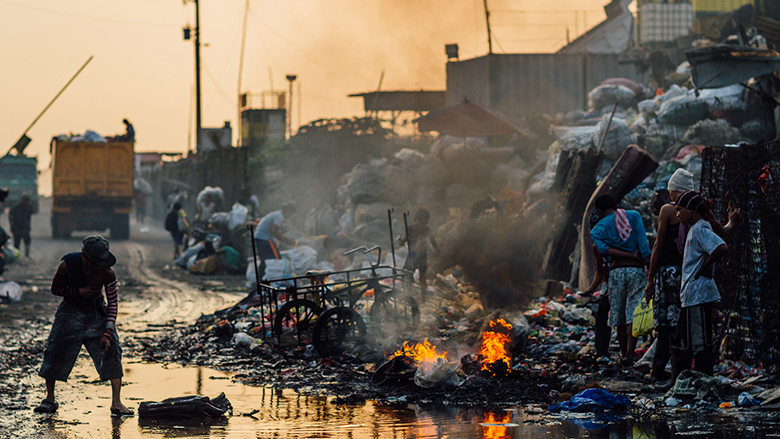 And with over 90% of waste openly dumped or burned in low-income countries, it is the poor and most vulnerable who are disproportionately affected. In recent years, landslides of waste dumps have buried homes and people under piles of waste. And it is the poorest who often live near waste dumps and power their city’s recycling system through waste picking, leaving them susceptible to serious health repercussions. “Poorly managed waste is contaminating the world’s oceans, clogging drains and causing flooding, transmitting diseases, increasing respiratory problems from burning, harming animals that consume waste unknowingly, and affecting economic development, such as through tourism,” said Sameh Wahba, World Bank Director for Urban and Territorial Development, Disaster Risk Management and Resilience. Greenhouse gasses from waste are also a key contributor to climate change. In 2016, 5% of global emissions were generated from solid waste management, excluding transportation. While this is a topic that people are aware of, waste generation is increasing at an alarming rate. Countries are rapidly developing without adequate systems in place to manage the changing waste composition of citizens. Cities, home to over half of humanity and generating more than 80% of the world’s GDP, are at the forefront of tackling the global waste challenge. According to the World Bank’s What a Waste 2.0 report, the world generates 2.01 billion tonnes of municipal solid waste annually, with at least 33% of that not managed in an environmentally safe manner. An update to a previous edition, the 2018 report projects that rapid urbanization, population growth, and economic development will push global waste to increase by 70% over the next 30 years – to a staggering 3.40 billion tonnes of waste generated annually. How much trash is that? Take plastic waste, which is choking our oceans and making up 90% of marine debris. In 2016 alone, the world generated 242 million tonnes of plastic waste – equivalent to about 24 trillion 500-millimeter, 10-gram plastic bottles. The water volume of these bottles could fill up 2,400 Olympic stadiums, 4.8 million Olympic-size swimming pools, or 40 billion bathtubs. This is also the weight of 3.4 million adult blue whales or 1,376 Empire State Buildings combined. And that’s just 12% of the total waste generated each year. In addition to global trends, What a Waste 2.0 maps out the state of solid waste management in each region. 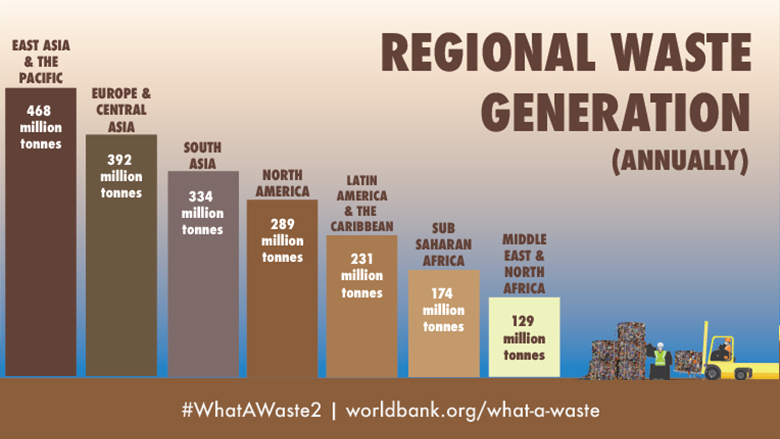 For example, the East Asia and Pacific region is the region that currently generates most of the world’s waste at 23%. And although they only account for 16% of the world’s population, high-income countries combined are generating over one-third (34%) of the world’s waste. Because waste generation is expected to rise with economic development and population growth, lower middle-income countries are likely to experience the greatest growth in waste production. The fastest growing regions are Sub-Saharan Africa and South Asia, where total waste generation is expected to triple than double by 2050, respectively, making up 35% of the world’s waste. The Middle East and North Africa region is also expected to double waste generation by 2050. Upper-middle and high-income countries provide nearly universal waste collection, and more than one-third of waste in high-income countries is recovered through recycling and composting. Low-income countries collect about 48% of waste in cities, but only 26% in rural areas, and only 4% is recycled. Overall, 13.5% of global waste is recycled and 5.5% is composted. Moving toward sustainable waste management requires lasting efforts and a significant cost. According to What a Waste 2.0, waste management can be the single highest budget item for many local administrations. In low-income countries, it comprises 20% of municipal budgets, on average. Yes. Research suggests that it does make economic sense to invest in sustainable waste management. Uncollected waste and poorly disposed waste have significant health and environmental impacts. The cost of addressing these impacts is many times higher than the cost of developing and operating simple, adequate waste management systems. To help meet the demand for financing, the World Bank is working with countries, cities, and partners worldwide to create and finance effective solutions that can lead to gains in environmental, social, and human capital. Since 2000, the World Bank has committed over $4.7 billion to more than 340 solid waste management programs around the globe, such as the following initiatives and areas of engagement. Given the overwhelming cost, financing solid waste management systems is repeatedly a significant challenge. The World Bank’s investments have stepped up to help countries meet that demand. In Azerbaijan, World Bank loans supported the rehabilitation of the main landfill site and establishment of a state-owned waste management company, increasing the population served by the formal solid waste management system from 53% in 2008 to 74% in 2012. Support also led to further sustainable waste management practices, helping achieve a 25% recycling and reuse rate. In China, a results-based incentive program has motivated household kitchen waste separation. The $80 million loan has also supported the construction of a modern anaerobic digestion facility to ferment and recover energy from organic waste, which will benefit 3 million people. In Nepal, a results-based financing project of $4.3 million increased user fee collection and improved waste collection services in five municipalities, benefitting 800,000 residents. Without improvements in the sector, solid waste related emissions will likely increase to 1.6 billion tonnes of CO2-equivalent by 2050. Improving waste management will help cities become more resilient to the extreme climate occurrences that cause flooding, damage infrastructure, and displace communities and their livelihoods. In Pakistan, a $5.5 million dollar project supported a composting facility in Lahore in market development and the sale of emission reduction credits under the Kyoto Protocol of the United Nations Framework Convention on Climate Change (UNFCCC). Activities resulted in reductions of 150,000 tonnes of CO2-equivalent and expansion of daily compost production volume from 300 to 1,000 tonnes per day. In Vietnam, investments in solid waste management are helping the city of Can Tho prevent clogging of drains, which could result in flooding. Similarly, in the Philippines, investments are helping Metro Manila reduce flood risk by minimizing solid waste ending up in waterways. By focusing on improved collection systems, community-based approaches, and providing incentives, the waste management investments are contributing to reducing marine litter, particularly in Manila Bay. When properly supported and organized, informal recycling can create employment, improve local industrial competitiveness, reduce poverty, and reduce municipal spending. But the reality for more than 15 million informal waste pickers in the world – typically women, children, the elderly, the unemployed, or migrants – remains one with unhealthy conditions, a lack of social security or health insurance, and persisting social stigma. According to What a Waste 2.0, successful interventions to improve waste pickers’ livelihoods include formalizing and integrating waste pickers into the economy, strengthening the recycling value chain, and consideration of alternative employment opportunities. In the West Bank, for example, World Bank loans have supported the construction of three landfill sites that serve over two million residents, enabled dump closure, developed sustainable livelihood programs for waste pickers, and linked payments to better service delivery through results-based financing. Understanding how much and where waste is generated – as well as the types of waste being generated – allows local governments to realistically allocate budget and land, assess relevant technologies, and consider strategic partners for service provision, such as the private sector or non-governmental organizations. In an era of rapid urbanization and population growth, solid waste management is critical for sustainable, healthy, and inclusive cities and communities. If no action is taken, the world will be on a dangerous path to more waste and overwhelming pollution. Lives, livelihoods, and the environment would pay an even higher price than they are today. Many solutions already exist to reverse that trend. What is needed is urgent action at all levels of society. 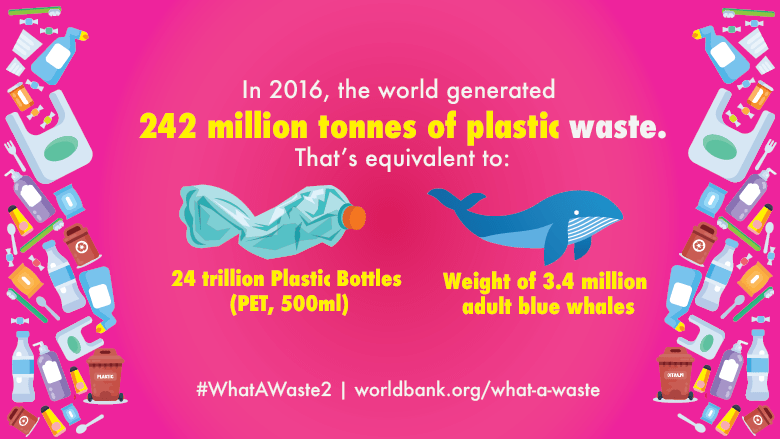 Click here to access the full dataset and download the report What a Waste 2.0: A Global Snapshot of Solid Waste Management to 2050. This entry was posted in Uncategorized and tagged Solid Waste, Solid Waste Management, Waste Management, World Bank, World Bank Group by NL4WorldBank. Bookmark the permalink.